Why not use RCA "doggy" in this TL as Planetary Rover ? Well, leg systems were studied in reality, as late as the 1980s and beyond, but they're just too mechanically complex for planetary rovers, at the present state of technology. Wheeled systems are simpler and better understood, and still work perfectly well (as we have seen). I must admit that as soon as I posted the update I realised that OTL’s Olympus Mons was named because it was the location (and cause) of the already-known “Nix Olympia” (“Snows of Olympus”), a prominent white marking sometimes visible from Earth that we now know to be clouds forming over the volcano. That would hold true ITTL too, so making it quite likely that the mountain would end up being called Olympus Mons in either case. I’d be interested what people think - is Tsiolkovsy Mons credible enough, or would it be better to ret-con this (and maybe give the great space pioneer the OTL Valles Marineris instead? If I can work out the latinisation…)? I think I might retcon it, and you can give Tsiolkovsky's name to Valles Marineris. I thought the Russians would not be quite so arrogant as to totally rename a well-known feature like that so yes, it has to be "Mons Olympus." But trying to "Latinise" Tsiolkovsky would probably break Latin! Seriously if anyone is enough of a classical scholar to know how a serious linguist would latinise that name, I'd like to see it. The Romans or Hellenistic Greeks would be arrogant enough to try I guess and so we all know names like Confucius or Mencius or for that matter Copernicus--Latin scholars, bring it on! But I figure it would just be "Valles Tsiolkovski." And on Russian maps, just "Tsiolkovski Valleys" using whatever the standard Russian word for "valley" is. if we can trust Google Translate anyway. I tried to see what "Tsiolkovski Canyon" would translate as--apparently the latter word in Russian is just "Kan'on" which is clearly just borrowed from the original Western, presumably Spanish, source--so going with good old Slavic "dolina" would probably be what they do. Anyway Carl Sagan once claimed, on a Cosmos episode IIRC, that "Valles Marineris" would most likely translate back to English as "Marinated Valley! " So we can do worse than letting Russians name things. For instance, if whoever maps out Mars photograpically first decides to stick as closely as possible to the Lowell-derived maps, they'd keep the old name of "Agathadaemon". "I had found that Nodus Gordis and Nix Olympica (Olympic Snow) were almost the only features to be seen" during dust storms,"
There were code named at JLP after Marx Brothers: Groucho, Chico, Harpo, Zeppo. until official naming. Now with Soviet pictures it could be that there label that not as mountains "gorá", but label it what there are volcano "vulkán"
So what about "Karl Marx Volcano"? "Oh, They name that thing after the black sheep of our family ? good match, it's a extinct Volcano !" 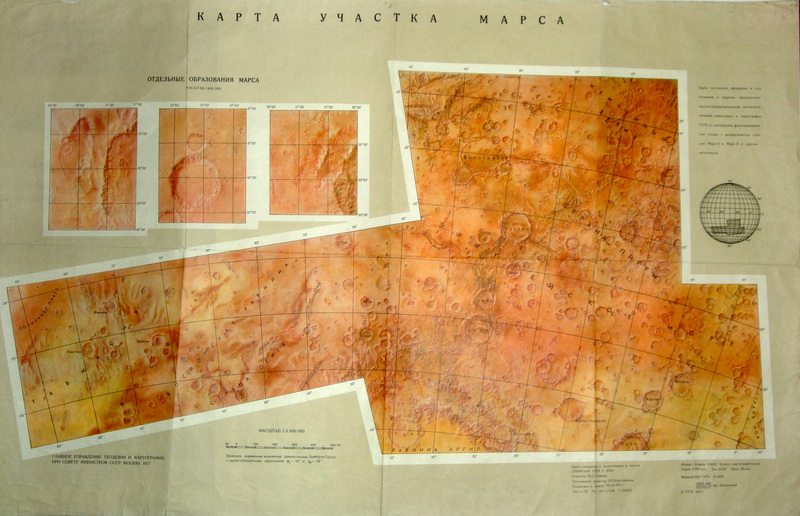 one: How are this feature label on Soviet Mars maps? second: What order the Politburo to label it ? Okay, I think there’s a consensus here! I’ll ret-con in the next couple of days. Regarding political names, I had the impression that all these names need to have the IAU’s blessing before they’re considered “Official”. Is that right, or does anyone know when that policy came into effect? It shouldn’t be a problem for dead scientists and the like, but I could see Stalin at least raising some eyebrows. That wouldn’t stop the Soviets using the names on their own maps of course, but that would undermine scientific discourse. For trusting Google Translate - well, put it this way, my Russian abilities pretty much stop at “Da”, “Nyet” and “Perestroika”! I’m with Workable Goblin on this one, I can’t see articulated limbs winning out over wheels. After all, even on Earth we stopped using legged vehicles around the turn of the 20th Century! Following the excitement of the dual Mercury-6/7 mission in 1964, the US manned space programme appeared to go into a period of hibernation. Having pushed its capabilities to the limit, the Mercury programme was wound down, with no further missions flown or planned. At a time when Zarya missions were continuing to break new ground, it appeared to some outsiders that the US had given up trying to compete with the Soviets in manned spaceflight. This impression was an illusion. Subsonic air drops of the Dynasoar ATV had continued throughout 1963, and in May 1964 Diana was joined in the air by Aura, the first production-model Dynasoar Mk-I. Like her sister-ship, Aura started testing by being carried aloft by a B-52 then dropped for a straight glide and landing at Edwards Air Force Base. This was followed by progressively more complex missions, exploring the full subsonic envelope of Aura’s capabilities and validating the results achieved with Diana. Meanwhile, Diana was progressing through a set of more aggressive rocket-assisted air-launches, using a small solid rocket (similar to the one planned for Dynasoar’s launch abort system) to propel her to supersonic speeds after being dropped. Astronaut Pete Knight became the first Dynasoar pilot to break the sound barrier on 12th April 1964, flying Diana at speeds in excess of Mach 1.2 before bringing her down to a safe landing at Edwards. This success was quickly followed-up with two more supersonic flights, but on the forth such flight, on 9th June, the nose landing gear collapsed on touchdown. The pilot, Mercury-veteran Neil Armstrong, was able to walk away without major injury, but Diana suffered major structural damage to her nose that ended her career as a manned test vehicle. The problem was later traced to a mechanical failure that hadn’t been spotted by the regular pre-flight checks, and procedures were updated to ensure that the relevant part would undergo regular inspection and preventative maintenance as part of normal operations. Aura was temporarily grounded to undergo inspections of her own gear, but was soon given a clean bill of health and re-commenced flying in early August, with her supersonic debut coming in late September. Soon afterwards, in November, Aura was joined at Edwards by Rhene, the second Mk-I glider. Whilst airborne tests of the Dynasoar glider were proceeding well, development of the Minerva rocket that was to carry them was going slowly. The original development plan agreed in January 1963 had been extremely aggressive and, as it turned out, unrealistic. Based on the experience obtained from Redstone and the considerable amount of design work that had already been done by Chrysler and the other contractors, von Braun had hoped to be able to launch the small Minerva-1 rocket (based upon the Liquid Rocket Booster of the larger Minerva-22 and 24 models) by the end of 1964. Inevitably, this schedule soon slipped to the right as the details were dug into further and funding proved to be not as forthcoming as had initially been hoped. As the projected launch date slipped into the second half of 1965, critics of von Braun within the Air Force were bemoaning the fact that, had they been allowed to continue with the development of the Titan launcher, Dynasoar could be flying by now. More seriously, the knock-on delay to the larger Minerva-2 and its variants meant that there was no launcher available for the large payloads the CIA and NRO were now developing. Then in August the suborbital flight of the Soviet Orel Raketoplan glider hit the headlines. Taken together with ongoing testing of the heavy Proton launcher, it seemed the Russians were again pulling ahead of the US. The added pressure from the Soviets and the intelligence community persuaded the Pentagon to release some extra funding for Minerva, and also helped to put a fire under Chrysler’s team. In November 1965 they finally delivered the first Minerva-1 LRB 1st stage to the Cape, almost a year behind their original schedule. However, the extra time taken in development appeared to have paid off when the Minerva-1 successfully carried its test-mass dummy upper stage on a suborbital flight of over 2 500 km across the Atlantic. A second test flight in February 1966, this time using a live Centaur 2nd stage, was also successful, placing a 2.5 tonne NESSA geophysics satellite into a 450 km orbit. Another suborbital test in late February threw up a minor guidance problem when one of the gimbal actuators on the E-1 engine briefly froze in place, but the rocket managed to recover with a divergence from its planned impact point of just under 25 km. With March seeing a second successful orbital mission, the Dynasoar Project Office decided it was time to test their bird in space. April saw Diana returned to service for the first, unmanned suborbital ballistic test flight for the Dynasoar programme. She was mounted atop a specially-modified Minerva-1 1st stage, designated Minerva-10, which had been fitted with large control fins to counter the effects of Diana’s own aerodynamic surfaces on the stack’s centre of pressure. Following a successful lift-off, the Minerva rocket arced on a southerly course, boosting the spaceplane to a peak velocity of almost 5.8 km/s. The booster spent, Diana separated from her adapter and made a number of brief bursts from her Attitude Control System rockets to orient herself for re-entry. Atmospheric heating of the molybdenum/ Rene-41 skin was within limits as the automatic pilot flexed the ship’s control surfaces to guide it down a radio beam towards the runway at Fortaleza, Brazil. The landing skids deployed and this time the gear held as Diana made an almost perfect landing on the leased military base, confirming that the Dynasoar glider would perform as expected. Following this Dynasoar-1 (DS-1) mission, Diana would fly aboard a rocket one more time, in a June test of the Launch Abort System. The solid rockets for the LAS were located in the short Adapter stage that on an orbital mission would sit between the glider and the Mission Module. For this test, the Adapter mated Diana to the top of an obsolete Jupiter IRBM, which fired the complete stack out over the Atlantic. At the point of maximum acceleration the LAS rockets fired to propel the glider and Adapter away from the booster. The Adapter then dropped away and Diana made a wide turn to bring her back onto a heading for the runway at Cape Canaveral. Unfortunately, on this occasion the automatic guidance system failed, and Diana ended her illustrious career plunging into the Atlantic Ocean almost a kilometre short of the runway. Despite this sad loss, the test review board quickly determined that the failure was not systemic and that had a pilot been aboard he would have either been able to manually fly to a successful landing or bail out before crashing. Dynasoar was therefore approved to begin manned suborbital tests. The first manned flight for Minerva came on 7th May 1966, with Neil Armstrong at the controls of Aura for an initial sub-orbital hop to Fortaleza. Once again, the Minerva-10 rocket performed flawlessly, and Armstrong was projected to a maximum altitude of just over 200 km as he arced southwards over the Caribbean. After he had re-entered the atmosphere, Armstrong jettisoned the cockpit heat shield and began a series of slow S-turns, verifying the glider’s aerodynamic performance at hypersonic speeds. Aura behaved as expected, but Armstrong reported the cabin temperature climbing higher than expected, peaking at a toasty 36 degrees Celsius as he entered Brazilian airspace. The fault was later traced to a blocked valve in the water wall cooling system, but didn’t cause any undue problems for Armstrong as he guided Aura to a perfect landing. More sub-orbital flights followed, with Dave Merricks piloting Aura on a trans-Atlantic skip-glide flight to Zaragoza, Spain, in July, followed by Pete Knight’s first sub-orbital mission for Rhene in early August. At the same time, the first of the Mk-II gliders, Athena, began drop-tests at Edwards, bringing the fleet up to three. With a successful first launch of the larger Minerva-2 rocket coming in late August, plans were drawn up for Dynasoar to make its orbital debut before the end of the year. This was an event anticipated with increasing impatience by the public and amongst the political classes as there was an increasingly urgent need to counter the perception of a Soviet lead in space. The Soviets had not been idle during this period, and on top of their continuing testing of Orel they had continued to pursue new on-orbit ‘firsts’ whilst the US tested their gliders. 1965 had seen the Zarya-5 mission in March reach an apogee of almost 2 000 km, giving cosmonauts Leonov and Tokarev the distinction of having travelled further into space than any other human, as well as proving Zarya’s capability to return to Earth from near-lunar speeds. This had been followed in January 1966 with Zarya-6, a solo flight by Viktor Gorbatko, commanding his second mission. Coming close on the heels of the launch of Kosmos-44, Zarya-6 was billed as a demonstration of orbital rendezvous and inspection of an uncooperative target, in the vein of the American Mercury-6/7 mission. In fact Zarya-6 was originally intended to be a full-on attempt at docking in space, a skill that would be vital for the planned permanent Almaz stations. The long delay between Zarya-5 and -6 had been due to installation and testing of the complicated rendezvous and docking apparatus on Zarya-6’s zenith port. Unfortunately for Gorbatko, and for Mishin, Kosmos-44 turned out to be even less cooperative than planned, as the separation from its upper stage had not been a clean one, damaging one of the satellite’s two radio beacons. This slowed Gorbatko’s approach, but when he did finally come into close range he discovered that debris from the damaged beacon was obstructing the docking collar. Thus thwarted, Zarya-6 returned to Earth after three days aloft. In April 1966 Mishin made a second attempt at the orbital rendezvous test, but the Zarya-7 mission was aborted twenty seconds after lift-off when the M-1 first stage began to deviate from its planned trajectory. The Escape Tower fired automatically, pulling cosmonaut Lev Dyomin and his Zarya capsule clear of the rocket before it was destroyed by ground command. Dyomin suffered no injuries from his ordeal, but the incident delayed the Zarya programme for several more months whilst the M-1 was checked over. This break in Zarya missions gave Chelomei a chance to shine, and in July 1966 Orel took to the skies once more on a six-hour orbital mission piloted by Vladimir Shatalov. With three successful flights under it’s belt following the failure of the second TMK-Mars launch the previous November, Chelomei felt confident enough in Proton to entrust his pilots to the two-stage version of the launcher. In addition to demonstrating the orbital capabilities of the manned Orel spaceplane, the Raketoplan’s AOO was fitted out with a sophisticated suite of electronic reconnaissance systems. Chelomei hoped to use these to demonstrate the military value of his system to a sceptical Kremlin, as well as establishing a Soviet lead over the US in spaceplane technology. After a perfect launch, Shatalov’s twelve-hour orbital mission succeeded in tracking and characterising a number of test transmitters Chelomei had set up to validate the ELINT sensors, and the flight was capped by a faultless re-entry and landing, with Orel’s jet engine successfully guiding it to the runway at Tyuratam. Coming hot on the heels of Mars-3’s entry into martian orbit, the Soviet and international press hailed the Orel mission as a further demonstration of the USSR’s pulling ahead in space technology. Chelomei hoped that this triumph would boost his own arguments to the bosses in Moscow that the Raketoplan was a useful Cold War tool, not the technological dead-end Mishin was claiming it to be. The US response finally came in November 1966, as pilot Neil Armstrong ascended the launch tower at Cape Canaveral to join his ship, Aura, at the peak of a Minerva-22 rocket. The gleaming missile was cloaked in a gown of white steam in the early morning light as the humidity in the air condensed against the oxygen-hydrogen filled upper stage, the first use of these propellants on a manned spacecraft. Armstrong crossed the bridge to enter the hatch on the Dynasoar glider’s roof, strapping himself into the ejection seat that, together with the solid rockets of the Adapter stage, would enable his escape should anything go wrong. With the hatch closed and locked by pad personnel, daylight could only enter the cabin through the two small side windows, as the main windshield was covered by a protective heat-shield that would be jettisoned after re-entry. For now, the blocked windows helped Armstrong to maintain his focus on the instrument panel in front of him as he ran through the pre-launch checks with Mission Control. At 08:15 local time on 10th November, the E-1 engines of the kerolox first stage and twin Liquid Rocket Boosters were lit and the Minerva-22 was released into the Florida sky. Guidance control for the rocket was linked into Aura’s systems, in theory allowing Armstrong to manually fly the missile from his cabin controls, but for this first flight the systems were fully automated. They performed exactly per design, initiating LRB shutdown and separation right on cue, then guiding the first stage to burn-out and separation before lighting the 2nd stage’s single J-2 engine to power the spaceplane the rest of the way up hill to orbit. Armstrong calmly reported all systems nominal as the stage completed its burn and the small Mission Module manoeuvring thrusters pushed Aura away from her carrier rocket and into free orbital flight. Almost a decade after the project had started, Dynasoar had reached the heavens. But for some back on Earth this achievement, whilst impressive, was not enough. If America wanted to truly demonstrate her superiority in the Space Race, something altogether more spectacular would be needed, and there was one man in particular who felt sure he knew what that should be. SO the Spaceplane looks like it's going to be around for a while then, but at least it avoids a serious downside relative to OTLs STS, in that they're quite small, and really just payload for the LV to take to LEO. Spectacular Space Event to really capture the public imagination? Well I already know what the obvious candidate it, but I guess we'll all find out in due time. Really enjoying reading about the development of the Space planes. I have always felt a opportunity was missed to push things differently. What are the performance stats on the Minerva? Was the X-20 pushed ahead of the X-15 to concentrate on full orbital capability? By 1963 in @ it was pushing sub-orbital space. Didn't know if it was used to gather data for the X-20. Keep up the good work really enjoying reading all the changes in this ATL. Martin had proposed the Titan I (kerolox version) for first phase, for second phase they want Titan I second stage replace by a Centaur Stage. Note: That along Eastern Range a Tracking system of Cape Canaveral Air Force Station, for Testing Rocket and Missile. The one orbit flight had start from Cape Canaveral Air Force Station true Eastern Range. At hight of 47 miles (76 km) the glider enter wester Range over Wake island at 15000 N mi from Cape Canaveral AFS. Eeh, that's actually not complete orbit, but who cares? I've been trying to puzzle out details of just what a given Minerva family member is and can do. -1 has a single E-1 engine and can serve either as a booster for a larger -22 (2 boosters, used for Dynasoar to orbit) or -24 (not used yet, would have 4 boosters). Or alternately as the first stage of a small stand-alone rocket that can put several tons in LEO using a Centaur for a second stage. The -2+ options mentioned above use the -1 as boosters on a core stage that presumably has more than one E-1 engine. But how many? Is there not a -20, that launches with no boosters at all, just the core? If the core has as many as 4 E-1 engines, then a hypothetical -20 type Minerva, just the core with no boosters, should match the performance of the OTL Saturn 1B pretty exactly--if anything should be an improvement on it because the Minervas use an integral tank design for the first stage, not the 1B's improvised cluster of scavenged Juno and Thor tanks. The ATL E engines are pretty exactly double the thrust of OTL H-1, and Saturn 1B used 8 of those on the first stage. The other parameter of performance--ISP--is identical for the two rockets, 260 at sea level, 290 in vacuum; the only remaining parameters are thrust/weight ratio and endurance. Therefore the Minerva-22 we see launching Armstrong's orbital X-20 should be overkill by a considerable margin; if the core stage has 4 engines the assembly should be able to orbit some 50 percent more than Saturn 1B, in the ballpark of 24 tonnes or more! I probably overestimate because the 2 side boosters don't burn as long as the core engines, but still if the core has 4 engines (as was planned for the Saturn 1B's original concept) the -22 ought to be able to boost a heck of a lot bigger craft into orbit than just a single Dynasoar. Even a stage with no boosters at all, a -20, would have more than enough oomph to get the job done, presumably matching OTL Saturn 1B at 16+ tonnes to orbit. Now, if I suppose there are just two engines in a core module, so that a -20 would be able to put perhaps 8 tonnes into orbit, and each pair of boosters adds say 6 more, then the -22 configuration we are shown could do 14 (still overkill!) and the Minerva system capability in all configurations mentioned would range from 4, to 8, to 14, to a maximum of 20 tonnes to a fairly high LEO. If the core stage had 4 E-1 engines as I supposed it would, it would be 4, 16, 22, up to 28 for a -24 cluster--that's 6 more than the maximum of 22 offered by von Braun in post 202 (Part II, Post #3) that introduced the Minerva series. Supposing then each pair of boosters only adds 3 tonnes to payload in the clusters, we'd have 4, 16, 19, 22 and it fits I guess. But that's an odd distribution and the boosters aren't doing much considering that a single one of them can launch well over 3 tonnes to 450 km all by itself with a Centaur upper stage. Going back to a pair being able to add 6, which seems only reasonable, and the bare core therefore being able to boost 10, the series would run 4, 10, 16, 22--which is a more flexible distribution, less clustered around the heavy range. But even here, with the boosters so "wanked" and core "nerfed," the bare core -20 configuration should be more than enough to boost a Dyna-Soar, IIRC in the 7 tonne range, to orbit. Starting with a -22 configuration as you do, there ought to be a pretty huge mission module attached to the back of the returnable, reusuable space plane module, some 9 tonnes of it--a mini-space station in its own right, with Armstrong and a partner able to go back once orbit is achieved and stay up there for weeks, doing Lord only knows what. A catch is, evidently using the 2-booster configuration the two side stages serve to provide the aerodynamic stabilization the extra wings on the suborbital test articles required ; a bare -20 with 10 tonne nominal capability for an axially symmetrical capsule would suffer from the weight and drag of such counter-wings and so reduce the capability, perhaps right down to the basic 7 tonnes of the X-20 itself. (This also suggests that if a mission with an X-20 were launched with the extra 15 tonne capability of the -24, some of that 14 would have to be deducted for tail fin needed by the symmetrical arrangement of 4 boosters, though I suppose their sheer mass would provide some of the stabilization). Should I conclude then that the -2x Minerva core can launch about 10 tonnes to orbit, and has 3 E-1 engines that are somewhat less efficient for some reason or other than 6 H-1 engines would have been on a 3/4 scaled down Saturn 1B? Or is it 2 E-1 engines, somehow performing better than OTL web info suggests, higher thrust or better ISP or something? And even so, why is the first orbital X-20 being launched with two booster stages instead of just that bare core, that should be quite adequate for that job with some margin left over for stabilizer fins and even a bit of extra payload in the form of a small mission module or extra fuel tanks or some such? Perhaps the most plausible premise is that the -2x has 2 engines, and can put 8 tonnes into orbit on its own, and this is, considering the need for stabilizing fins, just short of what is needed to orbit an X-20--but the pairs of boosters add 7 tonnes each, 3.5 per booster, which is consistent with the 3.5 tonne satellite orbited by a Minerva-1 we've been told of. Then the series runs--3.5 for Minerva 1, 8 for Minerva-20, 15 for Minerva-22, and 22 for Minerva-24--the first three in the series roughly doubling in capacity, which is a pretty good way to span the ranges desired I guess. This explains why it is necessary to go to a -22 to launch Dynasoar--but it also means we are still using about double the capacity we'd need for a right-sized Dynasoar launcher! I eventually turned to the Silverbird calculator, assuming all tonnages are for the 450 km orbit cited for the successful 2.5 tonne satellite launched by a Minerva 1. Using that, and guessing a launch to 29 degrees inclination, I estimate the -1 first stage has a dry mass of 6 tonnes and holds 110 tonnes of propellant. Using the calculator to then get the figures for the -2x core stage has proven quite tricky though. Assuming the second stage was identical to the OTL Saturn 1B would be rather arbitrary, because that stage OTL was designed with the Lunar mission in mind. Instead I note the two stages appear to be similar in size and that the hydrogen/oxygen propellent mix would be 44 percent the density of the ker-lox; with that assumption I come up with the core stage massing 10 tonnes dry with 145 tonnes of propellent, making the second stage mass 6 tonnes dry and holding 60 tonnes; with 4 boosters this should put a bit over 22 tonnes in 450 km orbit at 29 degrees from Cape Canaveral. But I'm pretty sure that's wrong because two E-1 engines burning 135 tonnes of propellent will exhaust the core stage much sooner than its boosters, which have 110 tonnes for just one engine. We clearly don't want the core stage burning out sooner than the side boosters! I haven't considered the possibility that the core stage also has just one engine, because that strikes me as rather silly. But strangely enough, if I do that the payload with 4 boosters actually increases, by some 400 kg! This made me wonder what would happen if I supposed the -2x core stage is in fact perfectly identical to the Minerva 1; volume proportionality would then imply the second stage would have dry mass of about 5 tonnes, and hold 48 tonnes of propellent--about half of an OTL Saturn 1B second stage (or Saturn V third stage). The 4-booster arrangement then (really a cluster of 5 identical standard Minervas) would fall short of the specified 22 tonnes, at 19.8 tonnes--though if we lower the target orbit to 185 km, a bit over 100 nautical miles, it exceeds it by a tonne. A single Minerva booster with the J-2 upper stage would throw 6224 kg to that lower orbit or 4949 to 450--so what we'd have would be something comparable to a Titan-Gemini, putting a tonne and a bit more into the same orbits for some 25 more tonnes total pad weight. And the 3-booster arrangement would launch 13,540 kg to the high orbit, or 15,891 to the lower orbit. What if we add a Centaur to the big 5-core/J-2 stack? It doesn't help much, just raises the high-orbit to 20.8, and does nothing good for the lower orbit at all. And adding yet more pairs of boosters seems to add another 5+ tonnes to the payload; at some point you'd want to consider sizing up the second stage if this were feasible. The neat thing about this system is, having already sized the second stage to match the first one's volume, pretty nearly, I went ahead and assumed identical dry mass as well. That won't be quite right of course, but every rocket stage in this series is the same linear dimensions and nearly so in mass except the Centaur. Upper stage variant--Dry mass 7300+--difference is mass of engines plus extra mass for insulation of hydrogen. Contains 58 tonnes hydrogen & oxygen. The next step I suppose might be to cluster on 2 more boosters and consider developing a new, bigger 2nd stage with 2 or more J-2s. Or at that point develop a new, bigger booster core--say we double linear dimensions for eight times the volume, and put seven E-1s on it, with six arranged around a central seventh, then put up to 8 boosters around it in pairs--that ought to get us over 68 tonnes to the 450 km orbit with a doubled mass and thrust second stage. Or considering that we've tripled the number of first stage engines we actually might want to triple the second stage, which would make it more massive than a Saturn V third stage but considerably smaller than that rocket's second stage; that brings us to some 76 tonnes, approaching the capability of a Saturn V. We ought to be; 15 E-1 engines comes close to 4 F-1s, the original design of the Saturn V before they realized they'd need a bit more thrust and added the 5th engine. The core alone with no boosters should be able to launch well over 40 tonnes to 450 km with the same tripled mass upper stage. But staying within the limits of this modified, simplified Minerva as given (which amounts, recall, with single boosters, to either a modest upgrade of Titan II or an Atlas with improved engines) we still can put up more tonnage than most modern "heavy" systems, including the STS; aside from the Saturns of OTL only Energia surpasses it, and the heaviest of the American evolved systems. This is with E-1 engines; as I remarked in an earlier post, isp of 290 in vacuum is rather uninspiring and we ought to be able to do better, up to say 320 or so, pretty easily for an E-2. If thrust increases in proportion, it should go up to 2080 kN per engine and payload to 450 km for the 5-cluster version to 28 tonnes, the bare core to 6.5 and the Centaur light satellite launcher to 4.4 tonnes--we could launch a Gemini with just that! And if it is possible to lighten a spaceplane, with just the bare core. Yes, but I’m afraid “due time” will be a little while yet! Part-III is currently about 40% drafted, and so it’s going to take a bit longer to get ready than was the case for Part-II. I’m currently targeting around the end of the year for releasing Part-III, but there’s a fair bit of uncertainty about that date. Could be sooner, but hopefully won’t be too much later. Thanks brovane! Regarding Minerva’s performance, more below. For X-15, it did fly pretty much as per OTL, providing valuable input into Dynasoar (which never got designated “X-20” ITTL as the Air Force is still making out it’s intended as an operational vehicle, not just an experimental craft). Well, art imitating life in this case! X-20 was such a detailed, advanced programme it left lots of goodies for an AH writer to plunder! I’d also like to thank both Michel Van and Archibald for providing me with some really good quality reference documents for the X-20. Thanks for that! Whilst I’m not sure if Cpt Dwight himself will make it into space (I think the butterflies have perhaps been a bit too forgiving on my astronaut selections so far), I’m sure it’s not long now until the first African-American astronaut gets a mission. Note that the “c” indicates use of a Centaur upper stage, except for Minerva-1 where it’s taken as read (Minerva-10 being the LRB without any upper stage). However, it seems adding a Centaur to the -2 series gives an extremely tall, thin rocket, so I’m currently debating whether these versions will be used or not. So, regarding which version of Minerva is used for Dynasoar missions, let’s look at the Dynasoar mass. For the Mk.I glider (1-man), I’ve assumed 5800 kg for the glider itself, plus 4450 kg for the standard Mission Module (including propellant and payload) for a total payload mass of 10250 kg (which, like most space projects, was above the original assigned weight limit). As you can see, this is more than Minerva-20 can handle. It would be possible to slim down the MM to fit Minerva-20, but this would reduce the spacecraft’s operational utility (which is already considered pretty marginal by the Air Force brass). My first thought was to go for a Minerva-20c, but apart from the long, thin stability problems noted above, e of pi pointed out that there would be considerable additional complexity to the rocket-MM interface (centaur is a smaller diameter than the Minerva-2 Upper Stage), as well as the support tower allowing the astronauts to board the glider. By going to Minerva-22, the same support structures and interfaces can be used for Mk.I, Mk.II and DEL missions. So you’re right, Minerva-22 is oversized for Dynasoar, but with the arguments above and given it was in development in any case, it was simpler to reassign Dynasoar to Minerva-22 (which will be used for DEL in any case) rather than try to tweak Minerva-20 to fit the new mass (especially considering the launcher was already behind schedule and the Air Force and NRO were screaming for the up-mass). As you’ve alluded, upgrades planned for the Minerva family in the late ‘60s may bring the 20 performance up to the point where it can launch basic Dynasoar missions. A point to mention on the 4x E-1 Core idea - have you checked the gee forces? When we ran the numbers on Minerva-20, we got a maximum acceleration just before 1st stage burnout pushing 4.6G. That’s acceptable for military pilots for a short duration, but doubling the number of core engines would push that into the region of 9G, which I considered just too much. In the event of an emergency the pilot would have almost no chance to take action. One point I must admit I don’t remember us looking into is the burn times. You’re right, it would be very embarrassing to have the core burn out before the boosters! The core has 220400 kg of propellant, with the LRBs carrying 82770 kg - so each LRB has less than half the propellant of the core, with exactly half as many E-1s burning it, so we should be safe. very good new chapter, i do wonder when will the US land on the Moon , and who will be the Astronauts , since neil Armstrong has fly the new Space Plane. Cant hardly wait for the next part . Assuming the Russians don't beat them to it! With the emphasis away from the moon in general this is a distinct possibility, depending on outcomes of politics in the USSR. Well, I've finally taken the time to read pt II. All very good stuff, and the twists you are putting to the foreign relations down on Earth are quite interesting. This is both the most original and plausible cold war timeline that I've seen in a while. I'm a little disbelieving that the dynasoar could ever become a working vehicle. It seems an inordinately expensive attempt to do most of the things a capsule could do, but more expensively. Also, wasn't it cancelled OTL well before either NASA or developments in the Soviet Union were constraining the Airforce space program? If I am right on that, how has it managed to dodge the bullet so long in this TL? If I'm not confused, it's because there is no civil NASA. The Air Force has managed to wangle the mission of humans--well, let's be era-authentic as well as simply accurate and say Man--in space in the USA. Exactly how the Navy got bypassed is something I'd have to go back and read. OTL the Navy was in shadow because the Soviets beat all American efforts to launch a satellite first, then it was von Braun's Army group that came through in the pinch to launch Explorer, the first US satellite (as they were capable of doing some time before Sputnik OTL and also here, but held back for political reasons a bit convoluted but basically easy to understand once you understand Eisenhower's priorities). So the Navy's failures with Vanguard, months late and many many dollars short, coming in a distant third, kind of put a pall over Navy claims on the mission. ITTL though Vanguard was exactly the success Ike wanted it to be, albeit not on the first try--but no one's rocket programs were very reliable so that doesn't look bad. The Navy delivered and I've forgotten how and why the Air Force managed to ace them out of Man in Space somehow anyway, but that is what happened. So an "Air Force Blue" MIS program represents the Air Force's vision of what the human space mission should be; they are thinking in terms of the craft being a super-SR-71, an orbital bomber, even a space fighter plane--naturally it has to be a pilotable airplane to do it right. The arguments have holes in them to be sure but with the Air Force in charge they stand unchallenged anyway. OTL, just having humans in space as such was supposed to be NASA's job; if any military service wanted their own manned space program they had to explain in detail just what the military mission was. Secretary of Defense McNamara wanted that explanation for X-20 and the Air Force's rationalizations were not solid enough to justify it, in his view, and Kennedy did not override him. He did approve MOL and thus Blue Gemini as part of it, because the Air Force did have reasons for that seemed solid enough. Advancing unmanned satellite tech undermined them though. The Navy would be in a stronger position (OTL) to argue for a deep space mission that would last months or years, but their proposals would still be channeled into NASA instead unless the Navy could show a specifically military aspect that made sense and was politically acceptable (criteria almost impossible to meet unless observations showed a distant object, such as an asteroid, that turns out to have clear signatures of being an alien artifact; that's all I can come up with anyway--and politics almost certainly means that OTL NASA gets it anyway unless the aliens were proven to be a violent threat). ITTL the Navy might make a comeback for Lunar or more likely interplanetary or anyway asteroid destinations, but by the time the USA could support such schemes, presumably USAF success in near-Earth missions would give them a lock on all space missions. (They might be politically required to accept some Navy crew, but they'd be detached to USAF command). It might have been more logical for the whole space mission to be given to the USN instead but there is no way the Air Force would quietly accept that and they'd have strong enough political support to demand at least a parallel program (perhaps restricted to near-Earth missions, but these would be all of them for a long time). Having two separate military space programs (that include all civil missions supported as well) would be an absurdly expensive way to go, or anyway it would be vulnerable to charges along those lines. I'm not sure how much the alternate perspective of TTL is due to Nixon rather than JFK winning in 1960. But OTL it was Republican Eisenhower who signed the orders creating civil NASA, albeit under partisan pressure from the Democrats, so I guess the partisan factor is something of a push rather than clear-cut. first and obvious reason was "Kaputnik"
USA needed something bigger and to leave a lasting impression on. So Manned flight came in focus and NAVY & ARMY had not heavy launcher for that, but well USAF with Atlas ICBM. in Mean time USAF was busy with future of Warfare in Space, the so called "Manned Orbital Weapons System"
Here the problems start X-20 needed a launch vehicle, Boeing wanted a Atlas Centaur like booster, but that was out of question for USAF. so start a eerie of Studies on Launchers who ends in use of Titan I, Titan II with solid booster and Saturn IB allot of time was lost on this. In same time it's role was taken by unmanned ICBM and reconnaissance satellite. So under Kennedy administrator Sectary of defense McNamara start to question the Dynasoar program usefulness. in same time NASA had terminated Gemini program (as Planned in 1963) so the hardware would be available for USAF use. Thanks Astronomo2010. I’ll try not to keep you waiting any longer than necessary! Thanks fasquardon! The impact of a changed space race on the wider political situation is something I was quite keen to explore, so I’m glad it’s holding up so far. Shevek23 and Michel Van have covered most of the bases in their excellent responses, but here’s my take on it. IOTL, NASA was created as a result of Congressional pressure (in particular from Johnson, who was Senate Majority Leader) to Do Something following the Sputnik Shock. The Air Force had already been pursuing Dyna-Soar, starting with General Operational Requirement 12 for a piloted, high-altitude, reconnaissance weapon system, which was released in 1955, and NACA looking into a skip-glide follow-on to X-15 since 1956. After Kennedy was elected, his SecDef McNamara demanded to know the operational use of Dynasoar, and the Air Force were unable to provide a good answer. Dynasoar was reclassified as a hypersonic research vehicle (X-20), but as Mercury progressed, and especially after Apollo was given the go-ahead in 1961, Dynasoar still had trouble justifying its existence, especially when the Air Force started looking at a “Blue Gemini” option for military manned missions. Finally, X-20 was cancelled by McNamara in 1963, who gave the Air Force MOL/Gemini as a consolation prize (which was cancelled in turn in 1969). ITTL a number of these key decisions go differently. First up, with no Sputnik Shock, there is less uproar in Congress following the first Soviet satellite, ISZ-1, and so the pressure to shake things up in the space programme is lessened (since the programme of record had succeeded in putting up an American spacecraft first). Hence no NASA to introduce a parallel civilian manned spaceflight programme. Next up, Nixon beats Kennedy. Differences in his character and approach, plus a reduced perception of the Soviets surging ahead, means no “We choose to go to the Moon” speech. Nixon instead broadly continues the approach he witnessed as VP under Eisenhower, a military-led programme focussed on military requirements. With this change of tone at the top, without McNamara to go digging, and with no civilian competition, the Air Force keeps a lock on the manned space mission. Though they concede to Mercury as a stop-gap “Man In Space Soonest” option (MISS being another OTL USAF programme) to ensure they beat the Soviets, a piloted spaceplane remains their preferred option for their 'real' manned space system. Once Minerva is sold as the US’ future “Universal Launch System”, Dynasoar (part of Minerva’s original raison d’etre) gains the support of a massive Military-Industrial alliance with a stake in seeing the project through to completion. By 1963 ITTL, it’s too late to start another programme for multi-crew missions to compete with Zarya-B, and Dynasoar has enough momentum to carry on, despite the increasing vagueness of exactly what military mission it will perform. Lastly, there’s no Apollo eating up massive quantities of cash, so there’s a bit less budget pressure in general on everything else, meaning calls to justify spending on Dynasoar aren’t quite as intense as IOTL. Later on, a similar effect comes about due to no Great Society and a different, slightly cheaper Vietnam. All this means Dynasoar makes it through to its first flight at the end of 1966, at which point it’s the only game in town if America wants humans in space. Exactly how the Navy got bypassed is something I'd have to go back and read. The Navy Vanguard programme, ITTL and IOTL, was always intended by Eisenhower just as a first placeholder, to establish Eisenhower’s cherished Open Skies principal with a ‘civilian’ (based on a sounding rocket) launcher rather than the far larger and more capable Atlas launcher (based on an ICBM) that the Air Force were developing. As I understand it, the plan was always to use the more powerful Atlas (especially for the Corona/Discoverer spysats) after the Soviets had conceded the point over Open Skies with Vanguard. The Army’s Redstone was an upstart that was never planned to be developed as a launcher because (again ITTL and IOTL) all long-range military missiles had been assigned to the Air Force, with the Army limited to IRBMs at most. ITTL, without the Sputnik Shock, the public is more accepting of the initial failures and the Navy has more time to solve the problems with Vanguard and put up the first spacecraft. When ISZ-1 proves to be far bigger, von Braun gets his chance with Juno (very similar to OTL), but Plan A for routine military space missions remains the USAF and Atlas. ITTL the Navy try to keep a foothold (and funding) with their space probes and an upgrade to a larger rocket (Vanguard is pitifully weak compared to Atlas), but the logic of consolidating all spaceflight in the Air Force wins out, so their Neptune rocket is cancelled and their space probe work eventually gets transferred to the civilian NESSA, though they’re still involved in the military comms and recon sats, usually in collaboration with the Army and/or Air Force. You made the DynaSoar dream come true so brilliantly ! Looks like dynasoar lasted longer than I thought - cancelled in 1963 IOTL. So no NASA would indeed be likely to give it a longer lease on life. I'm still quite dubious about dynasoar's ability to compete with capsules though. I don't see Faget about to lay down and let the wing lobby walk all over him - if nothing else, he might be able to secure a dribble of funding making capsules for high-energy re-entries. And every year, come budget time, dynasoar is going to have to answer the question "what can this do that a capsule can't do better and for less money?" And what is TTL's raketoplan like? There were so many paper versions in OTL, I am not sure what to picture in my mind when you talk about this raketoplan. I don't see Faget about to lay down and let the wing lobby walk all over him - if nothing else, he might be able to secure a dribble of funding making capsules for high-energy re-entries. It has already been stated that he is doing this, though I doubt the utility (in the long run, it's better to decouple the in-space and surface-to-orbit roles, and just have your moonship or whatever travel from Earth orbit to the Moon and back and be reusable; in that case, Dyna-Soar is perfectly good as a shuttle for astronauts). But Faget, whatever his merits, isn't working for the people who are actually launching people into space, so he has a limited ability to influence design; and, as shown by the Space Shuttle OTL (where Faget's preferred design was comprehensively overruled), he is hardly all-powerful or inevitably going to get his way. And every year, come budget time, dynasoar is going to have to answer the question "what can this do that a capsule can't do better and for less money?" Well, actually quite a number of things. First, it allows the exploration of high-hypersonic flight regimens, which is of value to the design of things like nuclear missiles and the like, much more so than capsules (because it can be maneuvered and flown during those periods, to some extent). Okay, so not a huge thing, but it is something that capsules are genuinely worse at. In the long run, you might be able to leverage that to build maneuverable, flying warheads, or orbital bombers or the like. Second, it can land on land and be reused--a capability which has already been used, as Neil flew Aura during both the suborbital and orbital missions. That means that it's rather dubious that a capsule would cost less money; not only would you have to develop and manufacture it from scratch (an important fact, now that Dyna-Soar's development costs have been paid for), but you would also have to manufacture new capsules for each mission. By contrast, each Dyna-Soar can fly a number of missions before needing to be replaced, amortizing the cost. Now, it may be that repairing and refurbishing it is quite expensive and cancels out the savings from building fewer, but given the relatively small size of Dyna-Soar and its use of metallic instead of ceramic tiles or refurbished ablative, it's less likely that that is the case. Third, it points the way towards an even larger and more capable spaceplane, one that will be even cheaper than rockets for launching, just the same way that the X-1 pointed the way towards supersonic jets. This is not really something capsules can do. In other words, you can replay most of the arguments which got people to build the X-15 or the Space Shuttle IOTL, and they apply just as well to the Dyna-Soar. There was a picture and quite a bit of description on page 12.